First published in 2008. Thought to update it through January 21, 2017. Only goes to confirm that raw statistics are just raw statistics. One last note in regard to this 80+ year period. Starting with Hoover 1n March, 1929 and ending with GW Bush in January 2009, the Democrats and Republicans split that entire period right down the middle: 40 years for each party. Trump started his presidency with the DOW at 19,827. This entry was posted in special report and tagged elliott wave, investing, markets, OEW. Bookmark the permalink. Democrats tend to spend more. Spending more causes asset inflation. Stocks are an asset. And the big spending Republicans had the same outcome. Reagan and GW. Not a perfect correlation but reasonably high. Wanted to see effect of President on performance beyond GDP & CPI effects so compiled estimated Annual GDP & CPI rates during terms (Col #2 &#3.) Column #4 normalizes DJI returns by CPI to ameliorate effects due to inflation only. Finally, I attempt to remove DJI attributable to other changes (population, productivity/technology growth…) as reflected by GDP growth and normalize by CPI. I believe growth rate in #5 reflects growth of DJI correlated to excess confidence/pessimism beyond roughly “fundamental” valuation effects. Sort ranking on #5 fairly similar to yours except for Roosevelt (length of term and very high GDP rate) and Trump (length of term). Highest non-fundamental exuberance for the roaring ’20’s and ’90’s bubbles – Obama and Trump (to date) seem(ed) to inspire somewhat similar bubblish exuberance. Column #5 values in the +/-3% range would to my thinking reflect DJI in line with expected “fundamental” change and “rational effects” of Presidential policies on GDP & CPI with lesser irrational effect otherwise. Below -5% may reflect excess pessimism inspired in part due to lack of confidence in Presidential leadership. Possible better analysis if use DJI from election to election rather than inauguration to inauguration as DJI has potential to anticipates newly elected president almost instantaneously (Trump Nov 2016, Obama Nov 2008 …) with GDP and CPI lagged to more correctly attribute lingering effects of previous President’s policies and delay for new President’s rational policies to affect GDP&CPI. Other analysis suggestions I’ve seen suggest normalization on a per capita basis and look at changes in Economic Performance Index (combines GDP, Inflation, Unemployment and Deficit growth). Also seen suggestions that better to use party of Senate majority than party of President when generalizing to political philosophy. Thanks for the fun. Sorry for the length – I guess brevity is beyond me. Best wishes for your Holidays and good health. Obama takes over during the great recession and his annualized 1.5% GDP is a plus? Column 5 attempt to look at “excessive” effect on DJI not linear attributable to GDP & CPI..so not really a penalty for taking over during depression/recession — one argument would expect GDP to rebound so why get excess attribution for what was bound to happen no matter who was (within reason) President? 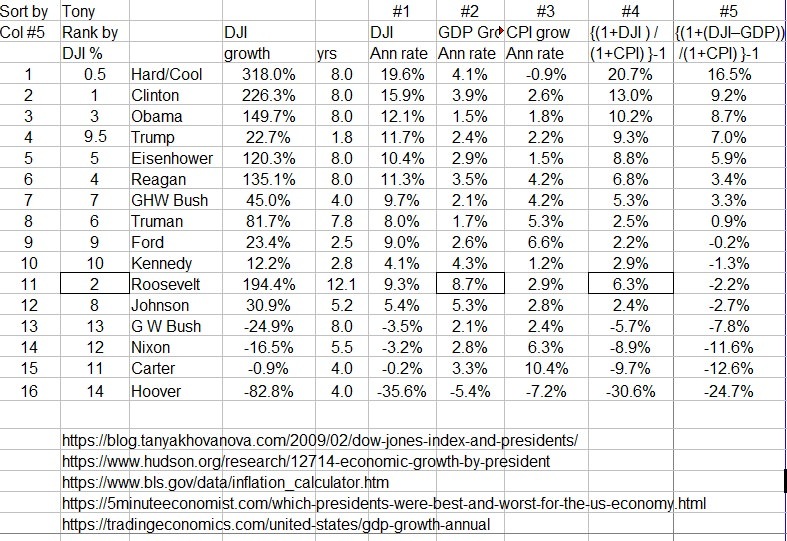 FDR policies may have inspired highest GDP growth but not so irrational as to cause excess/bubble growth in DJI (similar to many other presidents and not anything special). In contrast, DJI growth during Obama seems excessive given the low GDP/CPI growth rates, which leads to considering Obama DJI growth as potential irrational/aberrational behavior. Didn’t discuss Column #4 but it only accounts for term length and normalizes for inflation/change in dollar value of DJI without considering GDP. In that case, Roosevelt’s rank is similar to Reagan/GHWBush and slightly better than Truman. Obama ranking remains seemingly aberrational. What Presidency ‘algos’ started to be used. Where do you get these comments about “everything” bubbles? The only “possible” bubble is government debt but that’s only a bubble of others stop lending to those that owe and as the reserve currency and consumer of the world I don’t see others suddenly stoping lending to us. At least not anytime soon enough to be relevant to investment. Anyone doing honest research knows that the household balance is the best it’s been in decades. While absolute debt has risen depots have risen far more and $10trillion has been added on top of that to home equity. One can argue shiller PEs but it’s hard to take that person seriously at this point after it’s been wrong for two decades and there are obvious flaws with it. Commodities are clearly not in a bubble. Value stocks are clearly not in a bubble. REITS are trading at about a 5% discount to NAV so they are not in a bubble. This bubble talk is simply outrageous and believed only by those that want to believe there are bubbles everywhere to fit a feeling they feel comfortable having. It’s just not true.